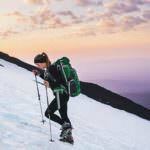 Plan Your TripAsk OregonMt Hood & Columbia GorgeWhere can I hike to a view of all the mountains? Off the top of my head, I believe the trail you’re referring to is the Larch Mountain trail in the Gorge. From the top on a clear day you can see Mt. Shasta, the Sisters, Mt. Jefferson, Mt. Washington, Mt. Hood, Mt. Adams, Mt. Rainier and Mt. St. Helens. Larch Mountain has 3 trailheads. The first is at Multnomah Falls. The second is about half way up the road, where the gate usually is locked during the winter season, or (!) you can just drive up to the landing .25 miles from the top. My personal preference is starting from the bottom and earning the view, but if you’re in a hurry to catch a sweet sunset with friends, I’d just drive up. Another one you might be thinking of is Mount Defiance. But the views there aren’t nearly as epic from the summit.